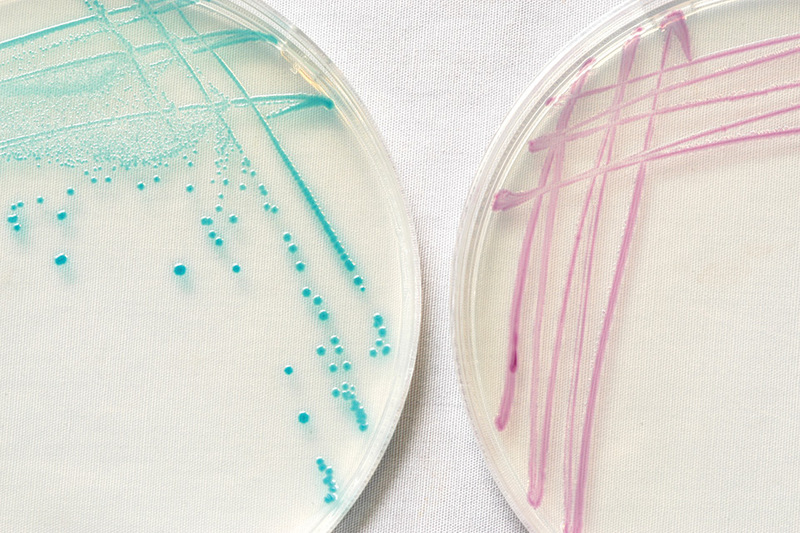 To identify foodborne pathogenic bacteria, researchers have developed specialized agar media to help differentiate suspect E. coli (blue colonies) from other bacteria. Photo by Steven Koike. The human pathogenic E. coli is in the news again. E. coli made news headlines too often in 2018 and early 2019 due to contamination issues with leafy vegetables. Certain strains of this bacterium, such as E. coli O157:H7, are extremely dangerous to human health. And it continues to occasionally infest vegetable commodities, despite safety precautions implemented in the growing, testing, harvesting, handling, and shipping of such foods. Our understanding of how foodborne bacterial pathogens contaminate vegetable commodities is progressing. But reviewing pathogen biology and field factors helps us better appreciate what the produce industry faces when improving food safety. It will also help farmers and field personnel better understand the bacteria that cause crop diseases, since similar biology and factors are involved. of foodborne pathogens like E. coli, Listeria, Salmonella, and Shigella. Being microorganisms, they are impossible to see or detect on agricultural produce with the unaided eye. Only specialized microbiological methods can find and identify these organisms. Those methods include culturing on specific media, enriching in nutrient broth cultures, and extracting of DNA from cultured colonies, which requires expertise. These detection methods require specialized equipment and materials developed by microbiology experts after many years of research. Human pathogenic bacteria’s microscopic size allows them to spread readily and to contaminate plant surfaces. A low number of bacteria in contaminated water, unwashed hands or gloves, and non-sanitized implements can transmit to leaves and plants upon contact. Diverse species of these bacteria cause various types of leaf spots, blights, cankers, crown infections, and rots. While the infection results in visible, notable symptoms on plants, the pathogens are usually not detectable with the unaided eye, just like human foodborne bacterial pathogens. And these diseases need specialized microbiological methods to find and confirm the plant bacterial pathogens. Culturing, enrichments, serological methods, and DNA extractions from colonies are essential to accurately diagnose plant diseases caused by bacteria. Because plant pathogenic bacteria are likewise microscopic, they can easily spread in a field and come in contact with host plants. 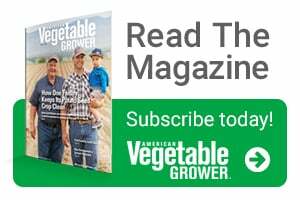 For vegetable crops, spread of bacterial pathogens most often occurs from splashing rain or irrigation water that moves the bacteria from infected plants to adjacent healthy ones. In addition, the microscopic size of plant pathogenic bacteria allows them to contaminate and colonize seeds as they develop in the mother plant; for many vegetable crops, the bacterial pathogens use this survival and dispersal strategy to become seedborne, thereby moving with the seed and growing on the new seedlings wherever they are planted. Foodborne human bacterial pathogens exist as an amazingly diverse biological group. A single pathogenic E. coli strain, for example, can be characterized as a member of one of six or more pathogen types “pathotypes.” Each pathotype contains multiple serotypes. This single E. coli strain can produce one of three toxin profiles, have one of several virulence genes, and contain one or more different genetic bodies called plasmids. Salmonella can be classified into various species, sub-species, and serotypes. In order to trace and investigate food contamination events, researchers need to know exactly which E. coli or Salmonella is involved. This complex diversity makes the study of these enteric bacteria a complicated subject that is constantly changing. Characterizing plant bacterial pathogens precisely can be critical. The specific profile of any one bacterial strain will dictate which crop it can and cannot infect. This diversity could complicate the work of plant breeders who are tasked with developing varieties that are resistant to a pathogen consisting of multiple genetic profiles. A lot happens in the fields where vegetable and row crops are mainly produced. An agricultural field is exposed to weather developments, animal and plant species living in the region, and inputs and influences from farming and other human activities. Many of these factors provide opportunities for E. coli, Salmonella, and other human pathogenic bacteria to persist in the environment long enough to come into contact with crops and harvested commodities. For E. coli and Salmonella, mammals and birds, respectively, are common carriers that act as sources of bacteria that could eventually contaminate crops. Winds can stir up and move bacteria-contaminated dust onto crops. Rain storms or mismanaged irrigations can create flooding that exposes crops to contaminated water. Because of the complexity of the farming environment, the exact source of E. coli or Salmonella contamination is not easy to determine, and extensive investigations try to identify where the bacteria originated. Plant pathogenic bacteria also take advantage of the farming environment and find ways to survive. Farmers themselves create opportunities for plant pathogens by growing the same crop too often. Clavibacter, Pseudomonas, Xanthomonas, and other bacteria can survive in the soil for short periods of time on diseased and contaminated crop residues. If the grower plants the same crop in back-to-back rotations, these bacteria have a chance at infecting the subsequent crop. Irrigation is another way that growers create favorable conditions for bacterial plant pathogens. When overhead sprinkler irrigation is used, the splashing water and resulting humidity favor bacterial spread and further disease development. Weeds are alternate hosts of some bacterial crop pathogens. The community of weed species growing near or within a crop could dictate which pathogens spread to the neighboring vegetable crop. Because maintaining high food safety standards for consumers is critical, the vegetable industry will continue to invest heavily in research intended to further our understanding of the biology of human pathogenic bacteria as they impact this industry. Further progress in keeping produce safe will require the continued dedication to research and the implementation of systematic food safety programs and strategies. 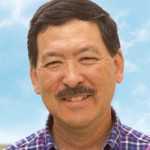 Plant pathology researchers likewise continue to investigate how plant pathogenic bacteria operate in farming systems. These pathogens continue to cause reduction of commodity quality and loss of yields and profits. Therefore, laboratory and field research continue to be needed so the impact from these damaging microbes can be reduced.